Emlaghmore is a small period Guest House set in private, secluded grounds just off the coast road in a wild and beautiful part of Connemara, in Co Galway, Ireland. It looks out over its own little river to the mountains, across moorland dotted with lakes, a haven for otters, raptors and unusual plants, a nature lover’s paradise. Behind the house is the shore of the Atlantic, with sandy beaches and rocky islands. Here you can watch seals, and fishermen bringing ashore their catch of lobsters, which sometimes find their way onto the dinner table. Comfortably furnished with antiques and family portraits, it has been used by the Tinne family for their holidays for over 80 years, and has now become a permanent home, opening its doors to a very limited number of guests, who can enjoy the wonderful surroundings which have made it so precious to its owners. 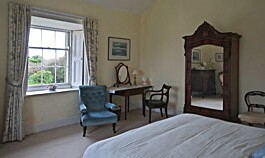 Guest Accommodation at Emlaghmore is provided on a Bed & Breakfast basis with optional Dinner. Accommodation consists of three double bedrooms; two have en suite bathrooms and one has its own separate bathroom. There is also a single room with its own separate bathroom on the landing. Unlike some impersonal hotels and grand Country Houses, Emlaghmore is compact and comfortably furnished throughout with items collected by family members over the years. Rooms are bright and spacious and exude an intimate and informal atmosphere. Dinner is served in the dining room each evening where guests all sit around the dining table with their hosts. There is a set menu and dinner must be booked in advance. If you you have any allergies or special requirements, please let us know when booking. There is a small selection of wines to choose from. 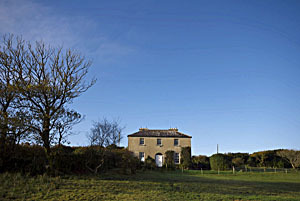 Emlaghmore has a self catering cottage which is available to rent, a few hundred yards from the main Lodge. This charming cottage overlooks Maumeen Lake and is about 400 yards off the coast road, in a spectacular open farmland setting. 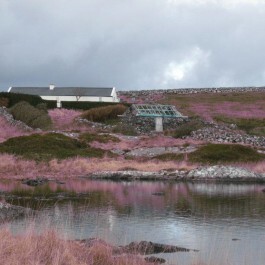 Situated on ¾ acre leading down to the lake, with wonderful views of the Connemara landscape of mountains, lake and sea. This is a traditional style cottage, which has been extended to sleep eight. It has four bedrooms, three have twin beds and one has a large double. There are two full bathrooms, a living room with open turf fire, a kitchen/dining area, larder, store room and linen cupboard with washing machine and tumble dryer. Bedrooms and living room are carpeted. The cottage has night storage heaters, electric radiators, dishwasher, fridge-freezer, T.V. and telephone provided. The kitchen/dining area is fully equipped, and gas for cooking, bed linen, duvets, towels and turf for the fire are all supplied. Callow bridge is on the coast road (R341) 13 kilometers from Roundstone and 5 kilometers from Ballyconneely. Take the lane inland 100 meters on the Roundstone side of the bridge. There is no sign on the main road, only on the second gate on the right up the lane. It is easy to find in daylight as it is surrounded by the only trees for miles.